And by “old dogs” I do mean “seasoned accounting veterans”. I just got home from the Midwest Accounting Show in Rosemont, IL, where I was honored (and a bit star struck) to have opportunity to eat some authentic Chicago deep dish with one of the most respected thought leaders in the industry, Dana “Rick” Richardson. Most people know Rick as the closer – it never fails that show managers put him on the schedule for the end of the day, and he comes in just like any good relief pitcher and gets them 1, 2, 3. After holding the attention of 1,500 accountants for over an hour and a half at the end of a long day, Rick was gracious enough to join my XCM Teammates, Brian Austin from Avalara, along with Doug Sleeter, Jody Padar, and Jennifer Warawa, three nationally recognized accounting influencers, for a “FOX” (Friends of XCM) dinner at Gino’s East. I think it’s safe to say that nobody on that bus knew exactly what was in store for the evening. Unfortunately, none of us were able to see Rick speak an hour earlier – but it didn’t matter, we all got our own private session at the master’s feet. We hadn’t even pulled into the Gino’s parking lot when my colleague, Beth Bruck, had resorted to making a “Rick List” on her iPhone of some of the technology devices Rick began to mention. As the conversation continued well into dinner (2 slices of pizza into dinner that is), that list kept growing. So did Rick’s audience, as he quickly added the third XCM blonde at the table, Jamie Soper. I couldn’t help but sit back in awe that here I was at a table with so many accounting greats – Jennifer, Doug, Jody, Brian – and Rick, who has been a rock-steady icon in the CPA world for longer than I’ve been alive, and might just be the most tech-savvy of us all. From being a Mac champion, to embracing the Cloud, to his love of productivity apps like Evernote…he proves more than anyone I’ve ever met that technology is not defined by age or by generation, but rather by willingness to think outside the box, and by a passion for achieving greatness. One of my very favorite blog posts of all time is by Scott Cytron: The Four Types of Trade Show Reps. For anyone who has had the pleasure of attending even half as many accounting conferences as me, it is clear that Scott is spot on. When I read this post a few years back, I immediately decided that if (when) I had my own blog, I would have to do my own take on this theme…so here it is, ladies and gentlemen, I give you the Four Types of Tradeshow Stalkers. Perhaps it’s the fact that I started on the conference scene at the ripe old age of 22, or maybe it was the fact that I’ve always been the one who just hates to miss out on any action, but it sure didn’t take long for me to discover that amid all of the amazing thought leaders, industry ISV partners, accounting press, and my practitioner friends is one more class of attendees: the stalkers. For those of you who know me, you’ll agree that I must have some type of stalker magnet and seem to attract what one colleague once referred to as “the best of the worst.” I’ve taken the liberty of categorizing these folks into four main groups. These poor guys barely get out of the house…but when they do, look out! Warning signs to watch for are strategically placed tan lines on the left ring finger, absence of any personal life discussions, and the combination of consistent yawning before 10pm (when they normally get to bed after the kiddos are down) & frequent unexplained trips away from a group when a cell phone rings “Sorry, I have to take this.” These are perhaps the most harmless of the stalkers, as they typically turn in early, but be careful friending them on Facebook; that woman in the photo might not be as friendly as her CPA husband. Another relatively harmless bunch may seem pretty normal in person, but save the good stuff for on-line follow up. These are the ones who get you to almost let your guard down at the show, before you quickly realize that they’re not merely interested in continuing the workflow conversation. True story: I once received an email that began “I normally don’t like Monday’s here in Utah, but last Monday started out quite well after our discussion about scanners…” My advice: Ladies, don’t be afraid of that block button – use it when necessary. I’m not an accountant…in fact, the one and only test I ever failed in my entire educational career was an accounting test (not that I’m still traumatized from that or anything). These days, the only accounting I’m qualified to do is numbering my high heels collection. I am, however, the ultimate accounting groupie – I love all my CPA friends like Adrian, Kara, & Dub-Dot. One of the things I most like hearing from them are stories about their clients, and what they do to deliver a great customer experience. When Shayna Chapman talks about one of the small business owners in her small Ohio town, it quickly becomes obvious that she is committed to delivering an amazing customer experience to these folks – and more importantly, that she truly cares about each and every one of them personally as well as professionally. While I find this impressive, some might say that making her clients feel special is part of her job as the business owner’s accountant and trusted business advisor – but is it really? I mean, doing a tax return and keeping track of a balance sheet is not too different than many of the other services that each and every one of us utilize on a daily basis – for example a dry cleaner – but how often does our dry cleaner make us feel special? When I bought my house five years ago, I spent a while exploring different neighborhood businesses; the hardware store, the coffee shop, of course the shoe-repair man, and several different dry cleaners. While I tend to be much more particular about where I get my morning cup of coffee than I’ve ever been about dry cleaning, I wound up returning to the shop around the corner that always sent coupons for 40% off services…hey, a penny saved is a penny earned! Well as unconcerned as I am with who handles my laundry, I’m equally insistent that I should receive superior customer service wherever I go, but especially at a business where I’m a “regular”. So over the past few years, as my wardrobe has gotten a bit more colorful (and a lot more high-maintenance), I’m making more frequent trips to the cleaners. What I started to realize, is that my dry cleaner didn’t really value me as a client – she often made me uncomfortable by asking me to pay in cash vs. using my debit card and wouldn’t give me the discount if I happened to walk out of my house without the coupon that morning. The final straw came when she recently closed the shop unannounced by posting a sign on the door – not very helpful when you need your clothes for a business trip. My dry cleaning honeymoon was over. As I tried to figure out where to take my next load of laundry, I happened to remember one shop in particular – they were a bit expensive I recalled, but boy, those people were friendly! I decided to try that first, and see what I thought. Much to my surprise, as I walked into Heritage Dry Cleaners in Irvine, I was greeted with a wonderful smile and a “Hello Ms. Hogan! Long time we don’t see you…” Whoa. Really? I hadn’t been there for four years, he remembered my name? Now that is what I call customer service. I’ll have you know, their prices haven’t gone down, but I’ve not gone anywhere else ever since that day. Sure, any of us can go to the local H&R block for a tax return, or can take our clothes to any local cleaner – but I guarantee that the ones who treat their clients like MY dry cleaner (and like Shayna), are the ones that will become invaluable to everyone that receives that superior customer service. So my challenge to you is to think about what you do to make sure that your clients feel valued. What do you do to let them know you care about them? That and $3.95 will get you a clean skirt to wear! 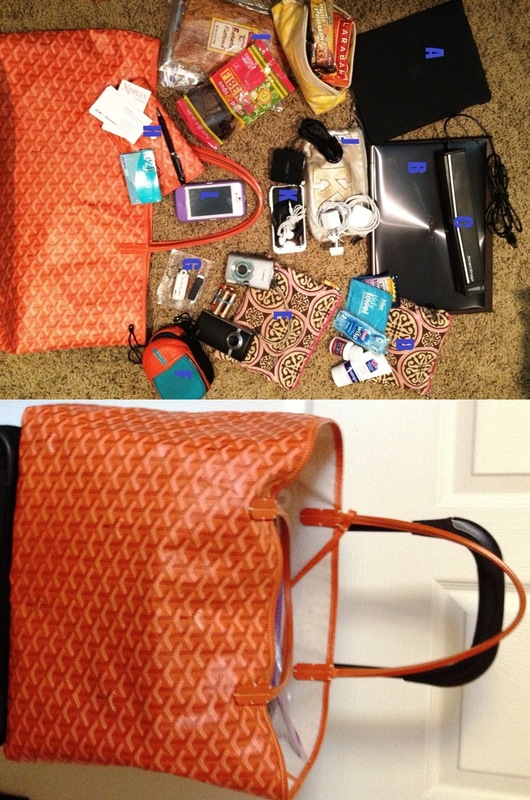 What’s in My (Orange) Bag? This past weekend was one of those weekends – spent packing up for a week in Boston for the XCM Quarterly Sales Meeting and our Summer team outing in Cape Cod. Now I’ve always prided myself with my ability to “pack small” – trust me, my carry-on bag is NOT light – but one thing that packing small requires is something I learned last year from one of my highly-respected fellow road warriors, Darren Root: “Everything needs to have a place”. While the inside of my Orange tote might look a tad different than Darren’s Tumi backpack, I’ve found that sticking to this system enables me to stay on top of things and ensures that I never leave anything behind. A – A is for Apple, so naturally, I always keep my iPad handy. From in-flight reading & pod casts (like the THRIVEcast), to email access, it’s a must-have whenever I’m on the go! B – Bye bye big laptops! My new Ultrabook is TSA friendly and doesn’t break my back while we globe trot together. C – Can’t live without my ScanSnap S1100 mobile scanner…I guess this falls into the “once you’ve had it, you don’t know what you’d do without it” category. D – Disaster Recovery Bag: You never know when you’ll need it, but you sure don’t want to be without things like hand cream, B vitamins (for those early mornings after late nights), EmergenC, wet wipes, and back-up travel toothbrushes. G – Gone are the days of lanyards or clip-on name badges…I travel with my ITA badge holder with a magnet back, so no more planning my wardrobe around those pesky nametags. PS – That’s my flash drive there too, which often saves the day itself. H – How convenient is this? My tote bag came with this strapped-in pouch which is perfect for the few things I’m constantly accessing: business cards, a pen, and gum. I – I might get hungry. I’ve learned my lesson to always travel with snacks. The only thing worse than going all day without eating, is trying to stomach airplane food. I’ve been caught too many times without time to grab something at an airport (or, even worse, landing in an airport after-hours when nothing is open). Protein bars, dried fruit, nuts, and these homemade energy bites (thanks, Pinterest) are my travel staples. J – Juice it up. This is my power pouch. Going back to Darren’s “everything needs a place” – when I keep them all together, it’s easy to do a quick cord-count when I’m dashing out of a hotel room to catch a flight. K – Kim’s favorite item: Mophie Juice Pack Air. This external iPhone battery functions as a case while charging your phone. This thing has saved me more times than I can count (including that night in San Francisco – right, Kara Haas?)! L – Life line. When all is said and done, there’s nothing I use more in this bag than my iPhone. It’s the last thing I power down on the plane and first thing to power up when we land. Whether it’s to call home, pay my bills while I’m gone, or get directions to where I’m going, I’d be lost without it (literally). There you have it – that’s what’s in my bag. Check back again soon and I might even show you how to pack 8 pairs of shoes into a TSA approved carry-on!